Dr. Salivonchik believes in using modern technology to provide safe, quality service to the residents of Allentown, and surrounding communities. And so, to help us meet our goal, we’re going back to school! That’s right, this May, we’ll grow our knowledge through a continuing education course on the most recent developments in radiation safety. We believe there’s no better way to maintain a consistent level of exceptional service than by continuing to learn. Our office uses digital radiography, which uses less radiation than traditional X-rays, and we want to do everything we can to stay educated so that we can provide you with the safest options in preventive care. Traditional X-rays have been used for years to provide necessary diagnostic views of internal structures such as tooth roots, but there are downsides. Traditional radiography emits as much as 90% more radiation than digital X-rays. Plus, developing the results requires using hazardous chemicals that cause potential harm to the people that come into contact with them, as well as the environment. Even without these potentially dangerous aspects, there’s also the inconvenience of having to store those X-rays and hand carry them when sharing diagnostic information with other doctors. When you come into our Whitehall office for a regular visit, your safety and well-being is one of our top priorities, right alongside great service and optimal oral health. 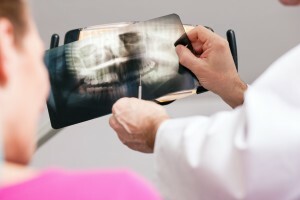 One of the first things we’ll provide as a part of our comprehensive dental services is digital X-rays. This is involves nothing more than placing a small sensor in your mouth. So for our patients, digital radiography isn’t just a safer option—it’s more comfortable too! But there are other upsides, too. The image that’s produce is more detailed, and because it’s digital, it can be re-sized to focus on a specific area of concern. Plus, because it’s digital, it’s easily stored and transferred, just like digital photography. Your safety is our number one concern. That’s why we’ve chosen to use digital radiography in our office, and why we’re taking a course in radiation safety this May. It’s just one more way we can make you smile. Whether you’re in Allentown, Bethlehem, Easton, or the Poconos, call our Whitehall office today to schedule your appointment with Dr. Salivonchik and his team.